The colors, the scents, and the feeling of autumn are the perfect backdrop for your wedding. What better way to celebrate this theme than with fall personalized coffee wedding favors? These unique wedding favors come in a variety of autumn themed designs, perfect to match your décor. 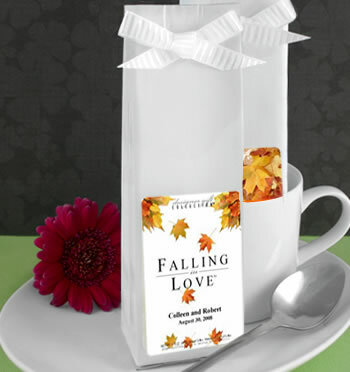 Your guests will enjoy the rich taste and flavorful aroma of these fall personalized coffee wedding favors. Each package can include your names and wedding date and holds 2.0 ounces of delicious coffee, enough for 10 to 12 cups. Production time is as short as 2 to 6 business days. Complete your autumn themed wedding with these fall personalized coffee wedding favors.